It is common for convenience stores in Japan to carry toys. Many of these toys are not only for children, such as this character from a spin-off series of the famous Japanese manga and animation series called Tensai Bakabon. This Animation is so famous that there is even a English Wikipedia page about it (link here). This plastic figure’s name is Atarou. It is one of a set. The name of this set is Manga Heroes. There appears to be twenty-four different characters, plus a special one, in this collection. 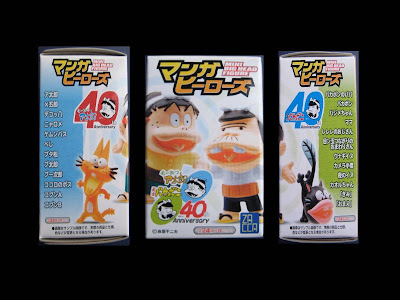 Even though I am not a big collector of plastic figures I was really hoping to get one the characters from Tensai Bakabon called Unagi-Inu (“Eel Dog” in English). To see more of the character figurines of Tensai Bakabon (and the spin-off series) available from this toy maker take a look at this link.